Candidates are advised to read the eligibility criteria carefully and ensure their eligibility before submitting the online application. The age, educational qualification & eligibility criteria shall be reckoned as on 01/11/2017. Relaxation for age will be allowed only in case of deserving candidate. Candidate with 2 years full time Master’s degree in finance / Banking /JAIIB / CAIIB will be given preference. 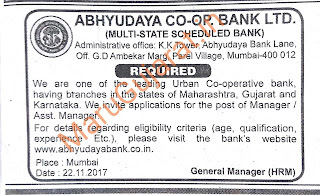 Minimum 7 years service in Urban Co-operative or Nationalized bank. At least 2 years in supervisory capacity. JAIIB / CAIIB will be given preference. Minimum 5 years service in Urban Co-operative or Nationalized bank. At least 2 years in supervisory capacity. Rs.57, 000/-(Approx) per month plus other benefits as per company rules. Rs.30, 000/-(Approx) per month plus other benefits as per company rules. Note: Application from local area candidates will be given preference for all the above mentioned posts. 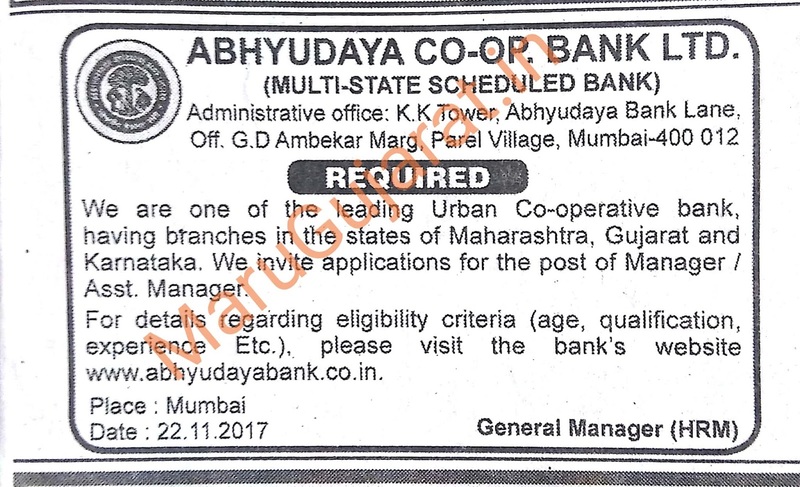 Interested candidates who fulfill the above mentioned criteria and having relevant experience are requested to register Online through Bank’s website www.abhyudayabank.co.in only between 24.11.2017 and 30.11.2017. No other means/mode of applications shall be entertained.